Sosian Conservancy sits in the heart of Laikipia, which 20 years ago, was almost exclusively a cattle and sheep producing area. As a result much of the wildlife was not tolerated. With the highest diversity of large mammals in Kenya, including the big five as well as wild dog, cheetah, spotted and striped hyena, jackal and caracal, which are all traditionally livestock predators, these species were persecuted by farmers and communities. Additionally primary grazers such as zebra and buffalo were seen as competition for grass, as well as hosts to a multitude of livestock diseases. However, as ancestral rangelands for much of Kenya’s wildlife diminishes at the hands of humans, areas like Sosian have become more and more crucial sanctuaries for wildlife. As custodians of this land our perception has changed, and wildlife and livestock are now part and parcel of modern day ranching on Sosian. Like many of the other properties in Laikipia, Sosian is determined to preserve and conserve the wild species native to this area, and prove that livestock and wildlife are not mutually exclusive, but are in fact beneficial to each other, terming the phrase ’Conservation Beef’. 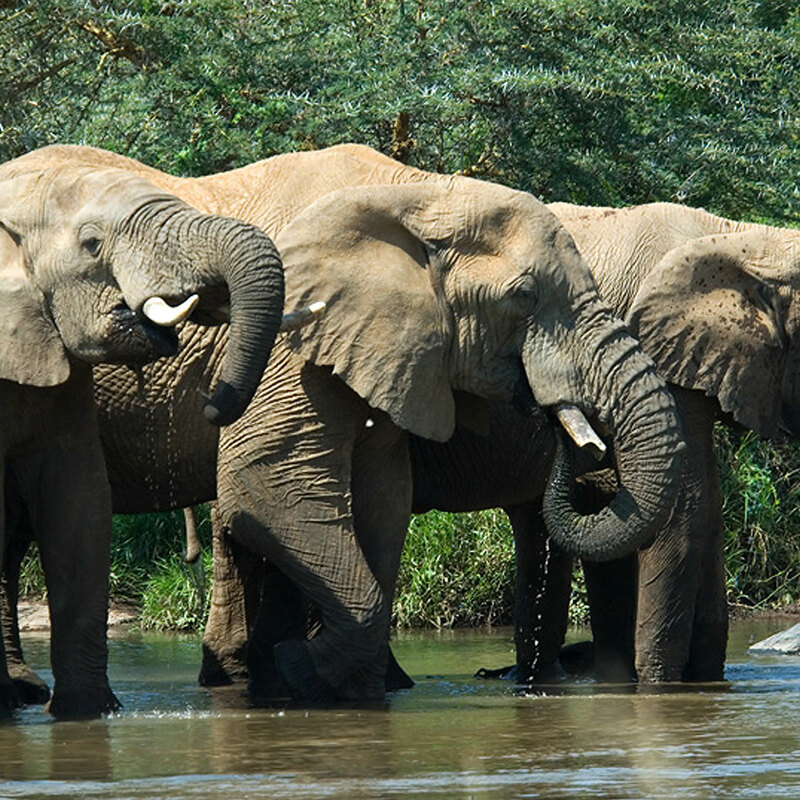 With large numbers of elephant residing in the Sosian Conservancy and greater area, we have a huge responsibility to protect these endangered animals from poachers. The ivory trade, despite its ban, operates fervently and over the years we have invested huge sums of money to provide the level of protection required. Our most effective strategy is boots on the ground in the form of well trained rangers. The equipment, communication systems and level of training required for them to do their job safely and effectively is an on going commitment that Sosian have made to our elephant populations. We are hugely grateful to the charitable work that For Rangers do to support us and our rangers. With highly trained rangers we are also improving the overall security of the area as well as counteracting further poaching incidents for the bush meat trade, to which giraffe, warthog, antelope and buffalo are highly susceptible to. Our rangers are always monitoring the wildlife and calling in any incidences of wounded animals that we may be able to assist. By better protecting our livestock, predators can co-exist in livestock farming areas. If lions, leopard and hyena do not have the chance to prey upon our cattle then there is no conflict! Over the past 20 years Sosian have developed and implemented a secure corralling (or boma) system to protect our cattle from lions at night. The traditional thorn branches cut to form a boma not only degrade the vegetation of the bush, but are also inadequate when lions try to spook the cattle out. Our current portable boma systems use interlocking 6ft gates that the cattle cannot stampede out of. Since using this method our cattle losses to lion have decreased by 90%. And our mature acacia trees and shrubs have increased greatly. The sole key to predator conservation is to eliminate conflict with humans and livestock, which results in retaliatory culling and poisoning of predators. To remove these issues means that lions can live freely and hunt naturally, forming stable prides which makes them more effective hunters for wild prey over domestic livestock. We also work alongside Lion Landscapes who are a not-for-profit organisation working closely with local livestock farmers to monitor the lion populations in each area. Learn more about Lion Landscapes and the work that they do. On Sosian there is currently 1 female lioness with a GPS collar, so we always know where she and her pride are, and can react proactively, moving livestock and informing neighbours, negating any conflict encounters. Together wildlife and livestock are a wonderful tool for grass management. Cattle are used to graze areas of tall, old grassland to clear it out and then primary browsers and grazers such as Grevys and Burchells Zebra, Eland and Beisa Oryx are not far behind. Over time this is proving much more beneficial than controlled burning, which brings a myriad of negative impacts to the environment. Additionally pumped water is a necessity for any livestock operation and the wildlife benefits from this as well, especially during the dry seasons. We also ensure that our cattle are not grazing and drinking near the permanent Ewaso Narok River during the dry season when species such as Hippopotamus and Buffalo are heavily reliant on the river and adjacent grazing. Equally we can carefully manage areas with less grazing by keeping livestock out and avoiding the devastating effect of over grazing the land, which can take decades to recover, leaving the area a barren wasteland in the meantime. Back in 1999 we systematically removed all fencing from Sosian allowing free movement of wildlife. Elephants, numbering some 6000 in the Ewaso ecosystem also play their role in keeping areas of the farm open and preventing bush encroachment which would reduce the area of grasslands available to other wildlife species as well as our livestock capacity. It is commonplace to find our cattle grazing in amongst herds of elephants and waiting their turn to drink at various water sources.